A word from Slim. $100 Google Adwords Bonus. $100 Yahoo+Bing Search Credit. Your Very Own Domain Name Wordpress Blogging Tools. Joomla Content Management System. FatCow Web Hosting was founded in 1998 in with the simple mission of providing the most reliable, affordable and fun hosting service for personal and small business websites. Since that time, we have grown into one of the largest and most influential hosting services in the industry. Throughout our growth we have stayed true to our core values. Today we provide all of our customers with a safe, secure, Green hosting platform all backed by the best support around, the Moo Crew. Since 2009, FatCow has been committed to purchasing Renewable Energy Certificates (RECs) to offset its use of electricity; this year, the company will purchase enough RECs to offset its use of electricity by 200%. FatCow's commitment to the environment will prevent 999 metric tons of carbon dioxide from being released into the atmosphere, this year alone; that's equivalent to planting 213 acres of trees or taking 196 cars off the road! FatCow's actions have not only inspired Moo Crew members who have made simple changes in their daily routines to contribute to the effort, but also our customers who proudly display their Green Server badges on their websites. Every FatCow customer is given a badge that they can place on their website to let visitors know that they're surfing a website backed by eco-friendly web hosting services. To learn more about FatCow's eco-friendly, visit our Green Hosting page. 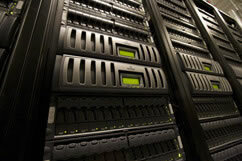 FatCow's web host services are served by two Boston-area data centers. Combined, they occupy over 2400 square feet of space, comprised of over 800 Servers and half a petabyte of storage … and growing, fast! Our network infrastructure is comprised of a pooled server environment, which gives virtually any server on our network the ability to access Web site files when a request occurs. This means that the first machine available will be the one to serve a customer's Web pages, giving our customer incredibly fast load times and fewer service interruptions than our competition. Fatcow's network-attached storage also enables any machine to access customer data. Each machine is clustered with another identical machine that will seamlessly take over if the primary unit crashes, ensuring customer data is always safe and secure. Additionally, these units are also backed by another set of storage units that include a mirror copy of the data in case of disk failure in the primary units. At FatCow, we understand that it takes more than impressive technology to be a top host; it takes a great team of people. Over the years, the Moo Crew, FatCow's customer support team, has developed a reputation in the industry for going the extra mile for customers. The Moo Crew is available 24x7, 365 days a year and can be reached via phone, email or online chat. Resolve issue on initial contact or set a firm, follow-up deadline. Review and improve support experience with customer surveys. You might be surprised at the number of people who are searching Google for exactly what you have to offer. Let's make sure they can find you. Sign up today and get $100 in free advertising when you spend $25. Advertise your business in search results on Yahoo!/Bing and other popular sites. You can put your business in front of potential customers at the precise moment they're searching for what you sell. Sign up today and we will give you a $100 head start! Personalize your website and email address with your own unique domain name, FREE with your first year of hosting. Start blogging in no time! WordPress, the Internet's most popular blogging app, is fully integrated and only a few clicks away. Our one-click install lets you create your whole website in WordPress or simply add a blog to any type of site. Keeping website content fresh is a snap. This content management system claims to power 2.6% of the sites. With its easy-to-use interface and rich feature set, you can add & edit articles, manage categories and change the look of your websites using templates. Great for posting articles, news, product information and help sections. More Room for Fatter Cows! Are you a FatCow on a small farm? Mooove your site to the next level! Our Pledge to You, The HeiferCratic Oath.